This article is about the Roman province. For other uses, see Pannonia (disambiguation). 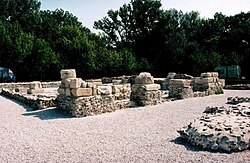 Pannonia (/pəˈnoʊniə/) was a province of the Roman Empire bounded north and east by the Danube, coterminous westward with Noricum and upper Italy, and southward with Dalmatia and upper Moesia. Pannonia was located over the territory of the present-day western Hungary, eastern Austria, northern Croatia, north-western Serbia, northern Slovenia, western Slovakia and northern Bosnia and Herzegovina. Julius Pokorny believed the name Pannonia is derived from Illyrian, from the Proto-Indo-European root *pen-, "swamp, water, wet" (cf. 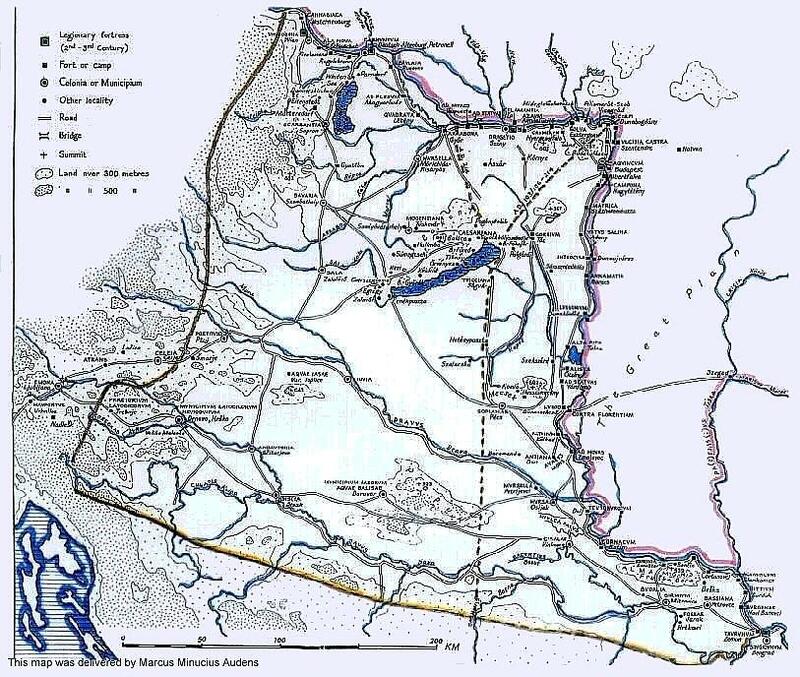 English fen, "marsh"; Hindi pani, "water"). Others[who?] believe that the name is related to the god of the nature, goats and shepherds Pan and/or pan, the Proto-Slavic/Proto-Indo-European word for lord/master, which could mean Pan's Land or Land of the Master(s), which is more probable due the fact the Ionian fleet supplied Pannonia via the Black Sea and Danube, and Panionium festivities were also well known in the region to its Celtic, Adriatic Veneti and Scythian inhabitants. Pliny the Elder, in Natural History, places the eastern regions of the Hercynium jugum, the "Hercynian mountain chain", in Pannonia (present-day Hungary) and Dacia (present-day Romania). He also gives us some dramaticised description of its composition, in which the close proximity of the forest trees causes competitive struggle among them (inter se rixantes). He mentions its gigantic oaks. But even he—if the passage in question is not an interpolated marginal gloss—is subject to the legends of the gloomy forest. He mentions unusual birds, which have feathers that "shine like fires at night". Medieval bestiaries named these birds the Ercinee. The impenetrable nature of the Hercynian Silva hindered the last concerted Roman foray into the forest, by Drusus, during 12–9 BC: Florus asserts that Drusus invisum atque inaccessum in id tempus Hercynium saltum (Hercynia saltus, the "Hercynian ravine-land")  patefecit. The first inhabitants of this area known to history were the Pannonii (Pannonians), a group of Indo-European tribes akin to Illyrians. From the 4th century BC, it was invaded by various Celtic tribes. 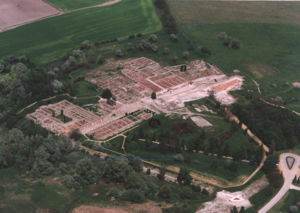 Little is heard of Pannonia until 35 BC, when its inhabitants, allies of the Dalmatians, were attacked by Augustus, who conquered and occupied Siscia (Sisak). The country was not, however, definitively subdued by the Romans until 9 BC, when it was incorporated into Illyricum, the frontier of which was thus extended as far as the Danube. Map showing Constantine I's conquests of areas of present-day eastern Hungary, western Romania and northern Serbia, in the first decades of the 4th century (pink color). In AD 6, the Pannonians, with the Dalmatians and other Illyrian tribes, engaged in the so-called Great Illyrian Revolt, and were overcome by Tiberius and Germanicus, after a hard-fought campaign, which lasted for three years. After the rebellion was crushed in AD 9, the province of Illyricum was dissolved, and its lands were divided between the new provinces of Pannonia in the north and Dalmatia in the south. The date of the division is unknown, most certainly after AD 20 but before AD 50. The proximity of dangerous barbarian tribes (Quadi, Marcomanni) necessitated the presence of a large number of troops (seven legions in later times), and numerous fortresses were built on the bank of the Danube. 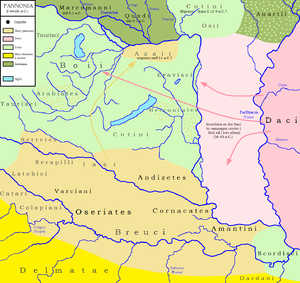 Some time between the years 102 and 107, between the first and second Dacian wars, Trajan divided the province into Pannonia Superior (western part with the capital Carnuntum), and Pannonia Inferior (eastern part with the capitals in Aquincum and Sirmium). According to Ptolemy, these divisions were separated by a line drawn from Arrabona in the north to Servitium in the south; later, the boundary was placed further east. The whole country was sometimes called the Pannonias (Pannoniae). Pannonia Superior was under the consular legate, who had formerly administered the single province, and had three legions under his control. Pannonia Inferior was at first under a praetorian legate with a single legion as the garrison; after Marcus Aurelius, it was under a consular legate, but still with only one legion. The frontier on the Danube was protected by the establishment of the two colonies Aelia Mursia and Aelia Aquincum by Hadrian. Diocletian also moved parts of today's Slovenia out of Pannonia and incorporated them in Noricum. 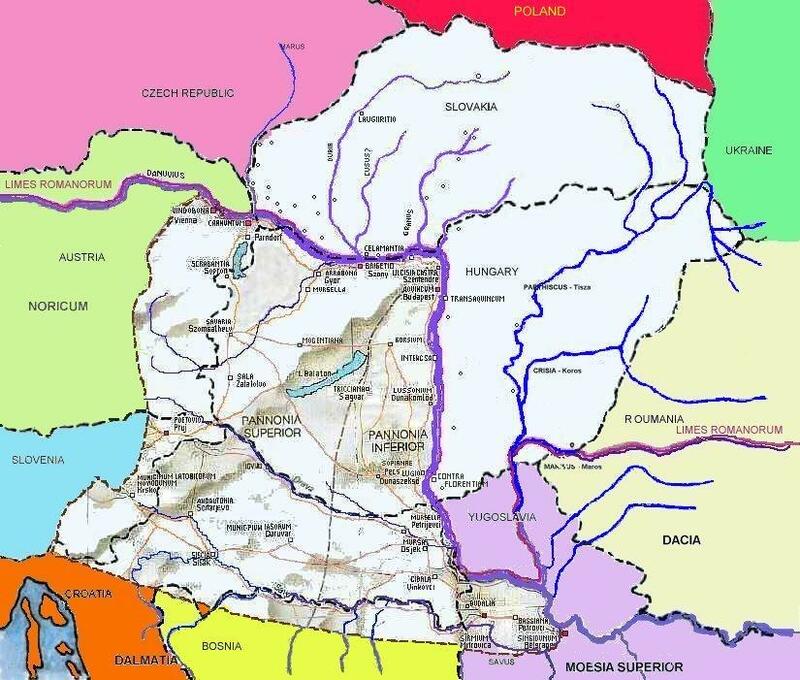 In 324 AD, Constantine I enlarged the borders of Roman Pannonia to the east, annexing the plains of what is now eastern Hungary, northern Serbia and western Romania up to the limes that he created: the Devil's Dykes. 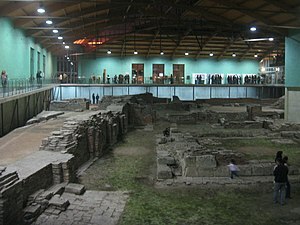 In the 4th-5th century, one of the dioceses of the Roman Empire was known as the Diocese of Pannonia. 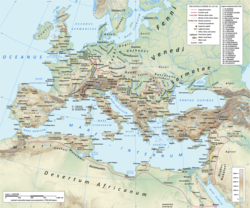 It had its capital in Sirmium and included all four provinces that were formed from historical Pannonia, as well as the provinces of Dalmatia, Noricum Mediterraneum and Noricum Ripense. During the Migrations Period in the 5th century, some parts of Pannonia was ceded to the Huns in 433 by Flavius Aetius, the magister militum of the Western Roman Empire. After the collapse of the Hunnic empire in 454, large numbers of Ostrogoths were settled by Marcian in the province as foederati. 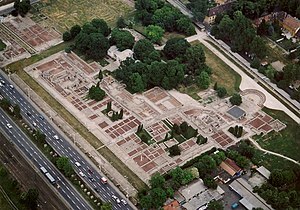 The Eastern Roman Empire controlled it for a time in the 6th century, and a Byzantine province of Pannonia with its capital at Sirmium was temporarily restored, but it included only a small southeastern part of historical Pannonia. Afterwards, it was again invaded by the Avars in the 560s, the Slavs, who first settled c. 480s but became independent only from the 7th century, and the Franks, who named a frontier march the March of Pannonia in the late 8th century. The term Pannonia was also used for a Slavic duchy that was vassal to the Franks. Between the 5th and the 10th centuries, the romanized population of Pannonia developed the Romance Pannonian language, mainly around Lake Balaton in present-day western Hungary, where there was the keszthely culture. This language and the related culture became extinct with the arrival of the Magyars. The country was fairly productive, especially after the great forests had been cleared by Probus and Galerius. Before that time, timber had been one of its most important exports. Its chief agricultural products were oats and barley, from which the inhabitants brewed a kind of beer named sabaea. Vines and olive trees were little cultivated. Pannonia was also famous for its breed of hunting dogs. Although no mention is made of its mineral wealth by the ancients, it is probable that it contained iron and silver mines. 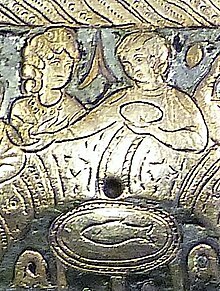 Its chief rivers were the Dravus, Savus, and Arrabo, in addition to the Danuvius (less correctly, Danubius), into which the first three rivers flow. The ancient name Pannonia is retained in the modern term Pannonian plain. ^ Vienna, Anthony Haywood, Caroline (CON) Sieg, Lonely Planet Vienna, 2010, page 21. ^ The third book of history: containing ancient history in connection with ancient geography, Samuel Griswold Goodrich, Jenks, Palmer, 1835, page 111. ^ The Archaeology of Roman Pannonia, Alfonz Lengyel, George T. Radan, University Press of Kentucky, 1980, page 247. ^ People and nature in historical perspective, Péter Szabó, Central European University Press, 2003, page 144. ^ Historical outlook: a journal for readers, students and teachers of history, Том 9, American Historical Association, National Board for Historical Service, National Council for the Social Studies, McKinley Publishing Company, 1918, page 194. ^ THE COTTAGE CYCLOPEDIA OF HISTORY AND BIOGRAPHY, ED.M.PIERCE, 1869, page 915. ^ The threatening nature of the pathless woodland in Pliny is explored by Klaus Sallmann, "Reserved for Eternal Punishment: The Elder Pliny's View of Free Germania (HN. 16.1–6)" The American Journal of Philology 108.1 (Spring 1987:108–128) pp 118ff. ^ Attila, the Hun – Google Knihy. Books.google.cz. 2003. ISBN 0-7910-7221-5. Retrieved 2018-10-17. "Pannonia" . Encyclopædia Britannica. 20 (11th ed.). 1911. p. 680. "Pannonia". Encyclopædia Britannica (online ed.). 29 March 2018. "Pannonia". unrv.com. Retrieved 6 November 2018.